As the weather continues to improve we realize Spring is upon us. With Spring comes the start of Major League Baseball, cleaning up the yard, setting up patio furniture, and getting the bicycle out of storage. One thing that I have been fascinated with in the recent months is drinking beer with a purpose other then getting drunk. One way to do that is by participating in a fundraiser sponsored by a great Craft Beer Tour company, like Motor City Brew Tours. Check out this official release from Motor City Brew Tours talking about their 4th annual Cruisin' for the Trails charity bike ride. 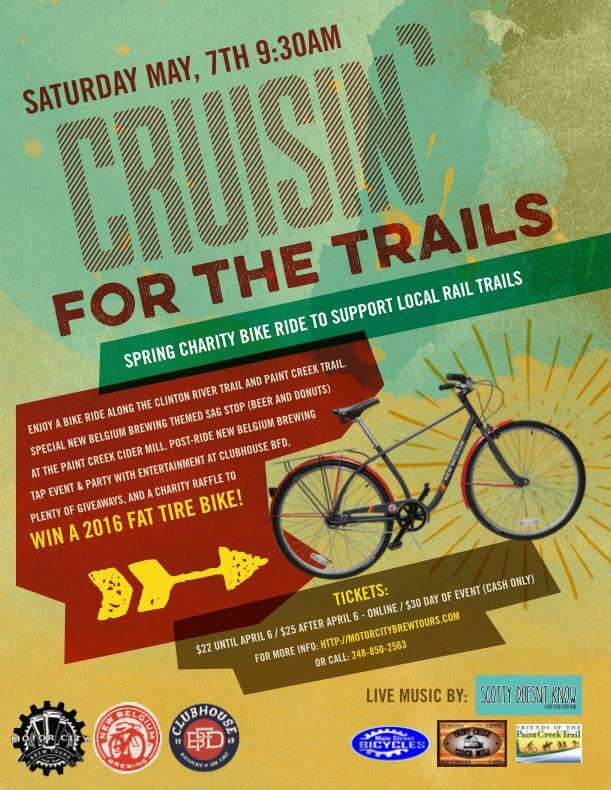 During the Cruisin’ for the Trails charity bike ride, one can enjoy a bike ride along the Clinton River Trail and Paint Creek Trail with a special New Belgium Brewing Themed SAG stop where ride participants will receive a New Belgium Beer and fresh donuts at the Paint Creek Cider Mil. After the ride, there will be a New Belgium Brewing tap event with $3 beers, food for sale and live entertainment in the parking lot of Clubhouse BFD in Rochester Hills. The post party will have plenty of giveaways and a charity raffle to win a 2016 New Belgium Fat Tire Bike, made locally by Detroit Bikes. The first 500 participants will receive a New Belgium Brewing Bike Bell and Motor City Bike & Brew Tours / Main Street Bicycles water bottle. “Enjoying beer and freshly made donuts at the Paint Creek Cider Mill at the halfway point of the ride. It's pretty satisfying to see all of the riders outside, steps from the trail, enjoying the day!” says Stephen about his favorite part of the cruise. The Friends are selling raffle tickets for $1 each for the 2016 New Belgium Brewing Fat Tire Bike, valued at $500. New Belgium Brewing is donating 100% of the cost of this local, Detroit made bike. Raffle tickets are available for purchase at Clubhouse BFD, or by visiting the Paint Creek Trail office, located in the Paint Creek Cider Mill, 4480 Orion Road, 2nd Floor, Oakland Township. Tickets are $22 until April 6 online, and $25 after April 6 online. Tickets will be available the day of the event for $30 (cash only). Registration on the day of the ride opens at 9:30 a.m. on May 7 at Clubhouse BFD, located at 2265 Crooks Road, in Rochester Hills. Along with the Annual Cruisin’ for the Trails, Motor City Brew Tours has unveiled their 2016 schedule for Motor City Bike & Brew Tours. Their tagline is “Learn About Detroit History and Get Rewarded with Beer.” This is the sixth season that Motor City Brew Tours has offered their very popular guided bike tour in downtown Detroit. Running May through September, they offer over 30 guided bike tours with seven different historical themes that end at breweries around Detroit. Participants enjoy lunch and beer included in their tour ticket. The newest tour route to be added this season to Motor City Bike & Brew Tours is the historical churches tour. Owner Stephen Johnson said, “This season, we are excited to share the stories behind many of the iconic churches that continue to be pillars of the Detroit community.” Other themes include brewery, prohibition, automotive, Corktown and Mexican Town history. This passion for local brewery history inspired Stephen to spend the last year delving deeper into Detroit’s brewing history as he did research and writing for his upcoming book, Detroit Beer – A History of Brewing in the Motor City. “Downtown Detroit was a melting pot of different ethnic groups in the 1800's all the way up to present day. With this diversity of people came a diversity in food and beer culture,” says Stephen. You can see the diversity today in the different beer styles being produced by breweries such as Motor City Brewing Works, Atwater Brewery, Traffic Jam & Snug, Detroit Beer Co., Batch Brewing and more. The book will be available for purchase May 16, check the Motor City Brew Tours website (www.motorcitybrewtours.com) for upcoming book signings or to purchase online. Motor City Brew Tours is ready for the bike season to start with Cruisin’ on the Trails, May 7th in Rochester Hills. They are also ready for you to join them on the weekends this summer with bike and brew tours in Detroit where you get to learn more about local history and brewing. We look forward to seeing you on a bike this summer. Cheers! About Motor City Brew ToursMotor City Brew Tours formed in 2009 with one purpose, to take people to beer. They offer guided bus, bike and walking tours to Michigan breweries. 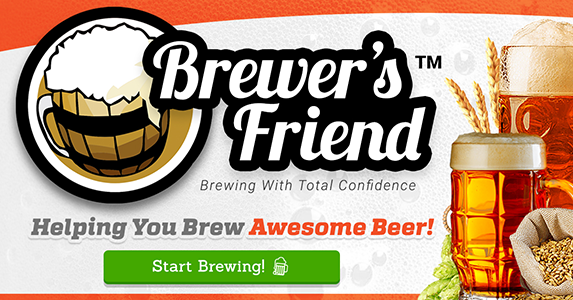 We work with Michigan breweries and have over 50 brewery partners! Since June 2009, we have taken more than 10,000 people to Michigan breweries. More information about Motor City Brew Tours is available at:http://motorcitybrewtours.comDuring the Cruisin’ for the Trails charity bike ride, one can enjoy a bike ride along the Clinton River Trail and Paint Creek Trail with a special New Belgium Brewing Themed SAG stop where ride participants will receive a New Belgium Beer and fresh donuts at the Paint Creek Cider Mil. After the ride, there will be a New Belgium Brewing tap event with $3 beers, food for sale and live entertainment in the parking lot of Clubhouse BFD in Rochester Hills. The post party will have plenty of giveaways and a charity raffle to win a 2016 New Belgium Fat Tire Bike, made locally by Detroit Bikes. The first 500 participants will receive a New Belgium Brewing Bike Bell and Motor City Bike & Brew Tours / Main Street Bicycles water bottle. “Enjoying beer and freshly made donuts at the Paint Creek Cider Mill at the halfway point of the ride. It's pretty satisfying to see all of the riders outside, steps from the trail, enjoying the day!” says Stephen about his favorite part of the cruise. Make sure you check out their website for more information and tickets regarding Cruisin' for the Trails as well the release of Stephen's new book. You can also check out my conversation with Stephen on Slurred Words Podcast. As we get closer to Cruisin for the Trails I hope to have Stephen back on the podcast to get an update on everything Motor City Brew Tours is doing.